As Mexico’s aviation industry continues to evolve post-deregulation, the country’s largest carriers are working to entrench themselves in their respective business models. With Aeromexico clearly the country’s full-service carrier and VivaAerobus and Volaris adopting more ultra low-cost strategies, Interjet is assuming the role of Mexico’s hybrid carrier – touting both a more upscale product and lower costs. Since its inception roughly eight years ago, Interjet has grown quickly, and is consistently ranked as Mexico’s second largest domestic carrier behind Grupo Aeromexico. Now it seems as if Interjet and Volaris trade off for those rights as each carrier has dedicated some of its expansion to international markets. Interjet now serves four Latin American markets and five destinations in North America. Interjet seems poised to solidify its hybrid model in 2014 as headlines have emerged that it is looking to align with foreign carriers and aims to keep its less-dense fleet configuration as Volaris adds seats to its Airbus A320s to further lower cost. It also continues to add smaller 93-seat Sukhoi Superjet 100s to its fleet, which reflects Interjet’s strategy of offering its hybrid product in Mexico’s smaller markets. From its launch in 2006 to 2011, Interjet rapidly built its domestic market share to 25%, and its market share for 2013 was roughly 24%. Near the end of 2011, Interjet began an international push to its now nine-strong markets outside of Mexico – New York, Miami, San Antonio, Orange County and Las Vegas in North America and Havana, Bogota, Guatemala and San Jose, Costa Rica in Latin America. Interjet’s share of international passengers among Mexican carriers grew solidly year-on-year in 2013 to 13% versus 9% the year prior. 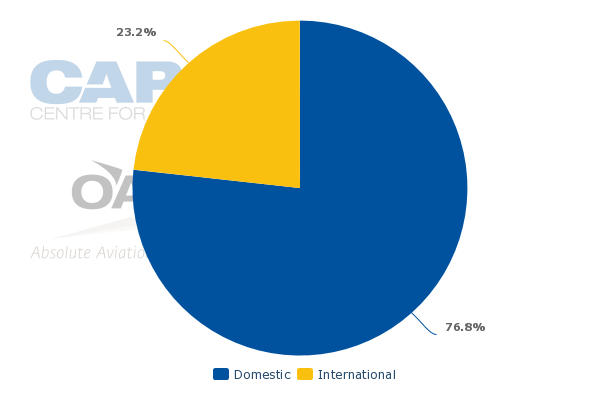 According to schedules in OAG and CAPA, for the week of 3-Mar-2014 to 9-Mar-2014, roughly 23% of Interjet’s ASKs are deployed in international markets. 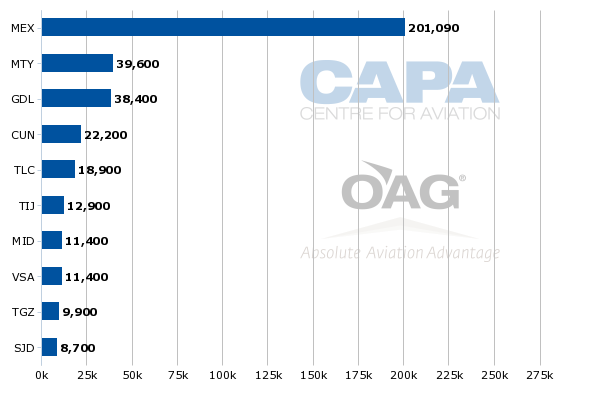 Interjet began accepting delivery of its smaller Superjet 100s in 2013, and presently has five of the aircraft in operation, according to CAPA’s fleet database. 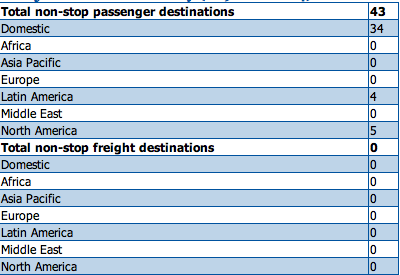 There are 10 Superjet deliveries remaining from Interjet’s orderbook, while the carrier has 40 Airbus A320neos on order. Deliveries of the re-engined Airbus narrowbody are slated to begin in 2017. Initially, it appeared Interjet was rolling out the smaller jets in some markets from Mexico City, but eventually the carrier plans to use the aircraft in smaller, less dense markets, likely pressuring Aeromexico Connect, which is in the process of shedding its smaller regional jets to operate 70 to 90 seat Embraer 170s/175s/190s. By YE2014 Grupo Aeromexico plans to operate 27 of those larger regional jets while its fleet of 50-seat ERJ-145s is falling from 33 to 30. Recently press reports have surfaced in which Interjet executives remarked that it believes opportunities exist for new service on regional routes including Tampico-Morelia and Tijuana-Veracruz. Schedules in CAPA and OAG show that no carrier serves Tampico-Morelia while Volaris offers service from Tijuana to Veracruz. Ultimately Interjet will find itself competing head-to-head with Aeromexico in those smaller markets as VivaAerobus and Volaris are sticking to their single-fleet strategies, which makes some of Mexico’s smaller routes unviable for those carriers. At the time Interjet was likely evaluating introducing smaller aircraft to join its 150-seat A320s the Mexican market was recording double-digit growth. It has slowed to the high single digits during the last couple of years, and just as Interjet was taking first deliveries of its Superjets during 2013 Mexico’s GDP growth was slowing to just over 1%, and pricing traction was deteriorating. Over the long term Interjet’s calculations in penetrating smaller regional routes are likely to pay off as Mexico’s four largest carriers – Aeromexico, Interjet, Volaris and VivaAerobus – continue to bump into one another on Mexico’s higher-volume routes. Presumably, Interjet’s calculus was that its lower costs would allow it to offer a similar product to Aeromexico at lower fares. Interjet remains privately held after shelving plans for an initial public offering in 2011. 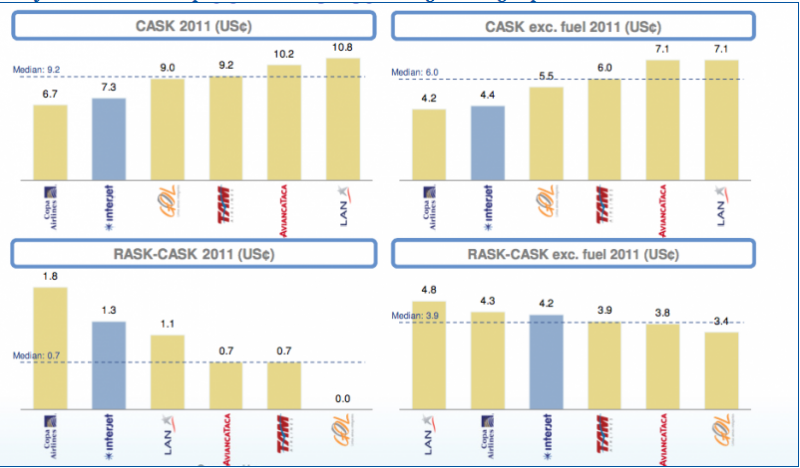 During a presentation in 2012, Interjet estimated its unit costs excluding fuel in 2011 were USD4.4 cents. With the introduction of the new aircraft type and international expansion, Interjet’s unit costs have likely risen during that time. Aeromexico’s unit costs excluding fuel during 2013 was USD5.9 cents, but the carrier has cost-cutting initiatives under way to drive down its unit costs. However, given Aeromexico’s larger scale and broader network, its unit costs are not likely to lower to the same level as Mexico’s low-cost carriers. Interjet, meanwhile, could face some challenges in the short term in launching new markets with its Superjets if pricing does not improve in Mexico’s domestic market place. Some of the initial Interjet routes were from Interjet’s largest base in Mexico City to Manzanillo, Mazaltan and Torreon. Those were already crowded markets – Manzanillo was served by Aeromar and Aeromexico, Mazaltan by Aeromexico, Volaris and VivaAerobus while Aeromexico and VivaAerobus served Torreon. On routes where it competes with Aeromexico, Volaris and VivaAerobus, Interjet offers a medium-frill product, leather seating with 34in pitch in both aircraft types, complimentary food and beverages and no baggage charges within stated limits. Volaris is positioning itself as an ultra low-cost carrier, and has stated margin expansion during 2014 largely depends on retaining its low costs and boosting ancillary sales. VivaAerobus also follows the pure low-cost model. A hybrid carrier within Mexico makes sense over the long term as the country’s growing middle class uses its discretionary spend on travel and becomes more savvy about value for air fare. Mexican carriers transported roughly 30 million domestic passengers in 2013. And with a population of nearly 119 million, opportunities remain to lure passengers away from bus travel. One wildcard that could help Interjet weather a sluggish recovery in Mexico’s economy is its reported discussions with other carriers to forge partnerships, and Iberia has been named in several news reports. Iberia does have long-haul service from Madrid to Mexico City, so accessing some of Interjet’s domestic routes, leisure markets in particular, might be attractive for both carriers. Aeromexico is a member of the SkyTeam alliance, so perhaps Iberia and oneworld are looking for a Mexican partner as air travel in the country grows. At the beginning of 2014 Interjet hinted it might again attempt a public offering. But that was prior to VivaAerobus suddenly cancelling its IPO due to market volatility. Volaris, which went public in 2013 and posted a 4Q2013 loss, has previously stated that it does not expect an upturn in Mexico’s economy until 2H2014. Interjet may also be disrupted by market volatility, and could wait until 2H2014 to make a decision regarding an IPO. In the meantime the airline continues to develop its hybrid strategy, which can endure over the long term, but faces obstacles in the short term as Mexico’s economy creates an overhang in the country’s domestic air travel market. Interjet is not alone as all of Mexico’s carriers face some level of uncertainty in 2014 as market conditions remain tenuous. Given those circumstances Interjet’s ambitions to both fully realise its hybrid potential and access the public markets may be put on hold until more favourable conditions materialise. Leveraging its hybrid profile to establish one or more partnerships may work to its favour in this respect, where they can deliver added traffic flows and support it in a competitive environment.